Located a little over 1,000 km from Antarctica, Rio Grande is one of the southernmost cities in the world. 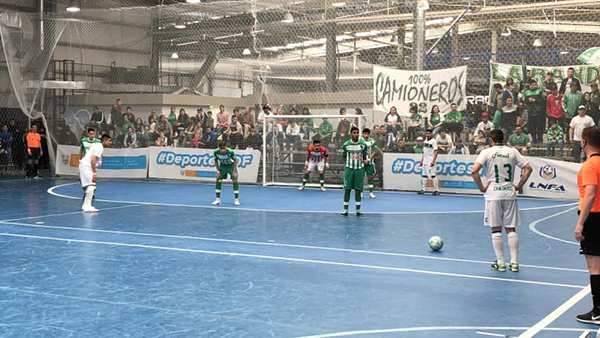 Here, in the heart of Tierra del Fuego, one of Argentina’s most scenic provinces, the FIFA Forward Football Development Programme is making its mark through a new and ambitious project: the Argentinian National Futsal League (LNFA). After over a year of collective work by members of the Forward Programme and representatives of the Argentinian Football Association (AFA), the project to create a meaningful and unifying nationwide futsal tournament in Argentina via the LNFA finally came to fruition in 2018: it has involved nine months of competition, 123 teams from more than 20 provincial leagues, 392 matches, 2,214 players, and qualification for the 2019 Copa Libertadores de Futsal. Between 9 and 14 October, the LNFA based itself in Rio Grande, which played host to one of the five regional stages of the event. Twelve teams from across Patagonia Region competed at the 'Arena Sport' complex, with Camioneros (from Rio Grande) eventually defeating Ateneo (from Ushuaia) in the final. Both teams were able to celebrate in the end, however, as the pair claimed the two available berths in the National Stage, during which the 12 best futsal teams in Argentina will vie with each other for the right to be crowned inaugural LNFA champions. Ever since La Albiceleste emerged victorious from the FIFA Futsal World Cup Colombia 2016, the sport has enjoyed a significant upsurge in popularity in Argentina. “The number of clubs and players showing an interest in participating has increased a lot,” Jonathan Sanzi, President of the AFA’s National Futsal Commission, told FIFA.com. Recognising this new landscape, Diego Giustozzi, coach of the 2016 world champions, broached the idea of the LNFA to the AFA and its president, Claudio Tapia, who gave the initiative his seal of approval. And so began a process that “was launched with the aim of becoming the continent’s biggest futsal tournament,” according to Luis Castro, the AFA’s Development Director. And FIFA was also involved in the creation and development of that framework, making available consultants with vast experience in the field and providing ongoing assistance through its Member Associations Americas subdivision and the respective Regional Office, located in Asuncion. “They advise us, they keep us on the right track and they help us, right down to the smallest details. Javier Lozano [two-time Spanish FIFA Futsal World Cup-winning coach and member of the Technical Study Group] helped us so much with the initial outline and with the LNFA,” said Sanzi. The tournament, which is broadcast live on Facebook, kicked off in April with the Provincial Stage. Now, with the Regional Stage having already concluded, there are only two berths left to fill at the National Stage: the champions of the AFA’s Primera A and the hosts of this concluding phase, which will be played in December at a venue that is yet to be determined. “President Tapia has been unwavering in his support, and that has been key to the LNFA’s success. He’s a big fan of this sport and we are very grateful to him,” remarked Sanzi. Sergio Palacios, FIFA’s Regional Office Project Coordinator in Asuncion, one of the people who, in Santi’s words, “helped so much” with the establishment of the LNFA, was in Rio Grande and was able to verify the sport’s progress with his own eyes. “The FIFA Forward Programme has been crucially important in decentralising futsal in Argentina, providing hundreds of clubs and thousands of players from every region of the country with the opportunity to compete,” he said.